When it comes to single malt, I like the extremes the various whisky regions of Scotland offer, from the highly peated, bandaid-iodine-smoke flavors of Islay to the rich, fruity, sherry-focused Highland or Speyside whiskies. In the latter category, one of my favorites right now is GlenDronach 15. GlenDronach is a distillery that has flown a bit under the radar, although that is changing. The fact that the distillery was recently purchased by American liquor giant Brown-Forman (Jack Daniel’s, Woodford Reserve, Old Forester) will probably raise its profile in the States even more. GlenDronach is known for its exclusive use of sherry cask-aged single malt in the 12-year and older varieties, though, more recently, a peated variety and a bourbon and sherry cask 8-year GlenDronach have been added to the line. Now for some bad news: The 15-year (known as “Revival”) has been temporary discontinued. It is scheduled to return in 2018 after bottling was put on hiatus in 2015. The Revival pours a rich mahogany color and is 46% alcohol by volume. The nose is classically sherried with dried fruits along with candied nuts and malt. On the plate is more of the same: a rich (but not syrupy), balanced combination of figs, raisins, toffee, orange marmalade, and clove. The finish lingers with ginger, light citrus, and oak. GlenDronach frequently gets compared to the Macallan Sherry Oak line, and the comparison is appropriate. Both are unapologetically sherry-forward for those who like that style, and GlenDronach’s advantage is the value it provides; The GlenDronach 15 is comparable in age to Macallan 18, which costs over twice as much ($200). Last year, in our guide for Father’s Day gifts, I wrote, “any single malt fan would appreciate Glendronach 15 which, although it has been discontinued, can still be found and is the closest thing to Macallan 18 available for under $100.” The recommendation still stands, if you can find it, and my hope is when it returns in 2018 neither the price nor flavor profile change. 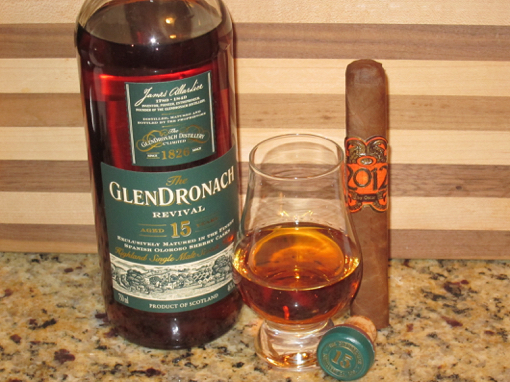 As for cigars, GlenDronach 15 is as versatile as it gets. It’s perfect after dinner with a mild, classic white label Davidoff, or with a full-bodied Nicaraguan puro. I purchased a few bottles of GlenDronach 15 when I found out it was being temporarily discontinued. It earns my full recommendation, especially for fans of sherried scotch. Pick up a bottle if you can find one. I doubt you’ll regret it.